London is full of odd pieces of art. Look down a side street and you'll see them, sculptures outside offices, and mosaics high above doors and windows. Walking down Regent Street the other day we passed an alleyway, and down the alley was a metal frame filled with sheets of engraved glass. 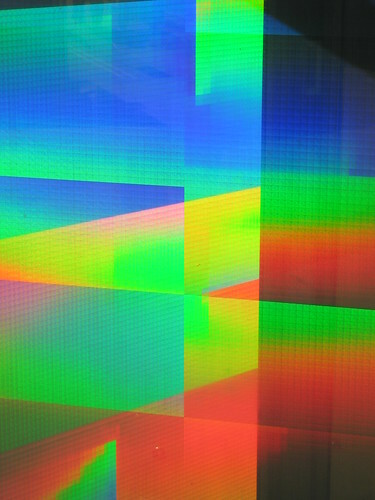 The result was a giant prism, catching the early evening light and turning it into an ever shifting grid of rainbows. Colours overlaid each other: reds, blues, greens in sparkling prismatic histograms. A spot of beauty in the city. Yet more reasons for always carrying a camera. That's gorgeous, that is. I love public art. Cities full of art are telling their citizens "We don't think you're stupid." Great picture, I love coming across surprises like this.